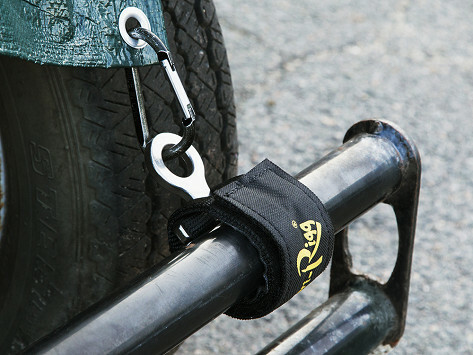 Create a super-safe, strong-enough-to-hold-a-motorcycle anchor attachment in seconds. The eye-loop strap clings to anything for a stable anchoring point that won’t stretch or snap. 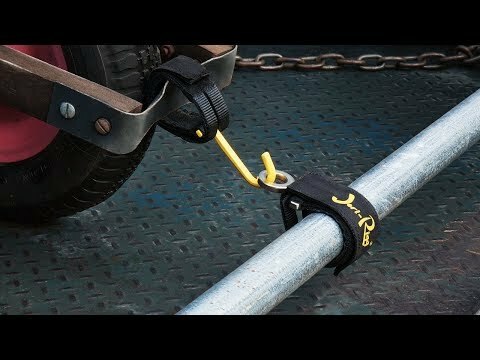 If needed, enhance it with other securing methods (e.g., bungee cords, tie down straps, ropes, chains). Get creative—there are literally hundreds of ways to put this rugged anchoring strap to good use. Small: Working load: 1100 lbs. ; Breaking strength: 3300 lbs. ; Can be wrapped around a 0.5" - 0.875" object; Dimensions: 6" x 1.5" diameter; 0.5" eye loop inner diameter; Weight: 0.19 lb. Small/Medium: Working load: 1330 lbs. ; Breaking strength: 4000 lbs. ; Can be wrapped around a 1" - 1.5" object; Dimensions: 8" x 1.5" diameter; 0.5" eye loop inner diameter; Weight: 0.25 lb. Medium: Working load: 1980 lbs. ; Breaking strength: 5950 lbs. ; Can be wrapped around a 1.5" - 2" object; Dimensions: 11" x 2.5" diameter; 0.87" eye loop inner diameter; Weight: 0.41 lb. Large: Working load: 3000 lbs. ; Breaking strength: 9000 lbs. ; Can be wrapped around a 2x4 or a 2.5" - 3" object; Dimensions: 13.5" x 3" diameter; 0.87" eye loop inner diameter; Weight: 0.78 lb. They keep things in place. Haven’t used them yet but seem durable and very well made. Gave them as b-day presents and were very appreciated!! slip proof sturdy tie down , very high strength that i'll depend on when hauling heavy stuff. These are great! I bought a small one to see how they were. Loved it. The small ones ARE a very tight fit but they do the job. I immediately bought some medium and large ones.